When you’re in the midst of The Encounter, it is an aural rollercoaster. In its aftermath, the show leaves you with intellectual whiplash. So much comes flying at you it might take a few days for your mind to catch-up. But the layers of ideas that underpin the show make this an unexpected and probing Broadway offering. For almost the entire performance, the audience wears headphones because the show is heavily reliant on binaural sound to create a sonically immersive environment (the incredibly complex sound design by Gareth Fry and Peter Malkin is a great reason to resuscitate the now-defunct Sound Design Tony award). 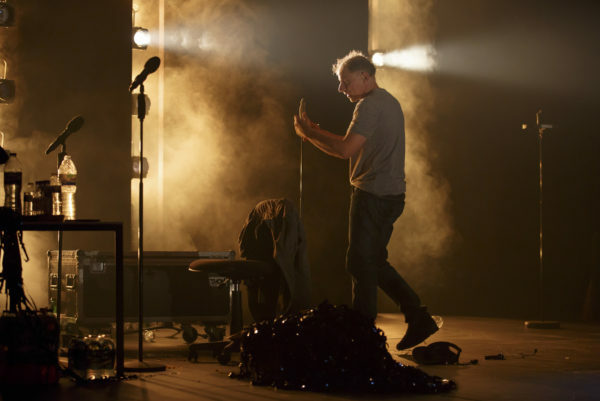 Once the headphones are on, creator-performer Simon McBurney begins to describe National Geographic photographer Loren McIntyre’s encounter with an “uncontacted” Amazonian tribe, the Mayoruna, in 1969. McBurney performs the voice of McIntyre as well as that of a narrator. He is intermittently interrupted in the midst of this tale, by recordings of his five-year old daughter who peppers her father with requests and queries. As we are watching, there is no confusion as to who is talking, where we are, or what the timeline is but there is a fundamental question of whether time is, actually, a line at all. The cultural construct of time is foregrounded here particularly in this meeting between McIntyre and the Mayoruna. What different cultures seek from time, how they envision it, and how it impacts their values, rituals, and behavior plays out in our heads as McIntyre spends more and more time with the tribe. He is fascinated with their mysterious quest to “the beginning” and so are we. As time is a construct, so is any sort of objective reality. McBurney speaks of the “collective imagination in a fiction” when we talk about borders, nations, or laws–things that do not actually exist but we believe in them. This too is something we are left to ponder. But most of all, we become acutely aware of the act of storytelling in The Encounter–the mechanics, the microphones, the music, and the objects of theatrical manipulation (those seen and unseen). Yet, we convert these articles of stage fiction seamlessly into this aural adventure, all the while knowing it’s a trick. Magician-like, McBurney in the beginning shows us what is up his sleeves. He explains the binural technology and demonstrates the sound effects. He asks us to think about empathy, proximity, fiction, memory, and consciousness–and then he has us confront each through the soundscape. With the headphones, we have no distance from the events because the show is happening inside our heads. With the intimate power of sound, we give over entirely to what we hear, even if we know it is not real. We’ve been told that’s not an actual recording of a buzzing mosquito and when we hear it later as part of the artificial cacophony of jungle sounds we do not stop and question it. On more than one occasion I nearly turned around when I heard a voice behind me, only to catch myself when I remembered it was all in the headphones. There are moments of layered audio that feel like a meta-narrative window into McBurney’s brain as he’s pulling from different resources to construct this show–recordings of experts on indigenous cultures, the author of the book about McIntyre (the inspiration for the show). Is the performance of the McIntyre narrative in front of us simply how McBurney imagined these voices in his mind as he was reading the book? But whether McBurney is perpetuating that by telling McIntyre’s account is less clear. As much as he has staged all of this around that narrative, it is part of a larger work designed to have us question assumptions. We are meant to dissect and analyze our faith in this heavily constructed stage reality, our collective experience, and all the sounds that have passed through the headphones. The hardest simulacrum to accept is the staged interaction between McBurney and his child–these sequences intentionally jar us out of the Amazon and raise other questions about our own traditions of storytelling. Though still within the loose remit of the piece, these interludes read more artificial than the fake mosquitoes. Perhaps that is their purpose. A conscious reminder that none of this is really real, even if all of it has happened.